Companies are always looking for new ways to streamline their customer support department efforts. This doesn’t strike us as a surprise. Markets worldwide are becoming more volatile and saturated as we speak, and providing excellent customer support is important for business success. In order to keep customers returning and keep that competitive edge, businesses have to use the latest software to deliver profound care. What tools are those? 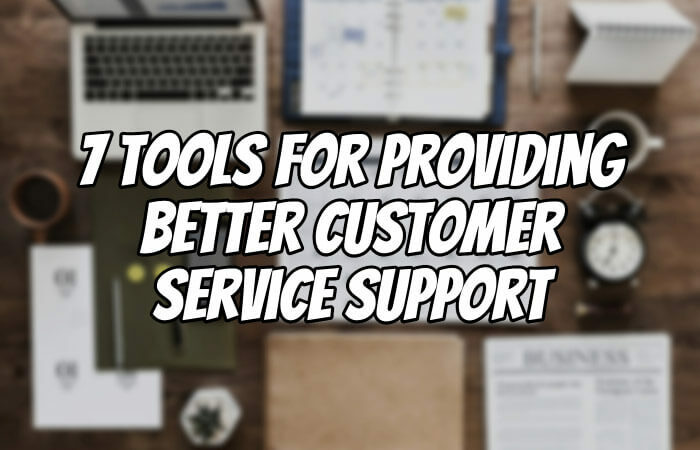 Stay with us, as we go through a list of 7 tools for providing better customer service support. Live support chat tool provides amazing opportunities for your customer support agents. Integrating it to your official website is simple, and, moreover, it is easy to use. Other than that, the integration empowers your agents to handle multiple customers at the same time, engage them when they arrive at your website while providing further assistance, and add more to that delightful shopping experience. Besides these, a live support chat tool comes with other functionality, too. For instance, your senior agents can oversee and be of assistance to their younger peers. You can also track and record conversations to identify trends and tailor your approach to customers accordingly. In the end, you can compile a list of commonly asked questions and publish a FAQ on your website as an ultimate ticket deflection solution. We live in a “Google It” era. The chances are that your customers are going to search for a solution online before they decide to directly contact you. Fortunately, you can seize this opportunity by publishing your online self-service help-desk. Thanks to the help desk software, you will be able to do it without any previous technical knowledge. With a search feature, your new self-service help desk will enable your customers to look for solutions wherever they are. Since it is a part of your website, all your help documentation will be indexed by search engines, thus increasing your chances of showing up in the search results of your competitor’s audience. Some customers still prefer using the phone over the other digital methods at their disposal. You have to make sure that your call center works towards providing a delightful customer experience at all times. Besides, there is nothing more frustrating for a customer than being on hold for a long period of time just to get disconnected. The automatic callback system will help you to bring your service system to another level. After the customer leaves their phone number, the system remembers their place in queue and automatically calls them back when the first support agent becomes available. By doing so, you will set your customers free from waiting in queues with a phone stuck to their heads. A dedicated mobile app is a great way to connect with your customers. When it comes to mobile apps you should know that there are no limits. You can embed your online shop in them, as well as a ticketing system, customer support agent call and chat functionality. Basically, you can make a window to any of your services via a mobile app. Customers will love it. In fact, 75% of customers rely on the Internet and their smartphones when they shop. Additionally, 50% of these customers prefer to use a mobile customer service app before any other means at their disposal. One word of advice, make sure to outsource your mobile app development to an established and renowned firm. You don’t want to end up providing support for a mobile app as well – you need it to work perfectly on as many devices as possible. Now, you might think: “Why would I need an email marketing tool for the customer support department?” Well, some customers still favor using email communication above anything else. And if you receive a lot of support requests and/or direct inquiries via this channel, it might be a good idea to use an email marketing tool. This tool will help you by allowing you to automate the responses to the emails you’ve received. You can schedule this response, make your own conditions that will trigger auto emails, and so on. For instance, you can inform your customers in distress that you have received their email and that you will get back to them as soon as possible. Remember, keeping customers in the information loop is pivotal for any business. This is especially true in case of those customers who are on the brink of getting frustrated. Today, businesses also have to nurture their online audience. With the popularity of social media platforms, this has become even more important. One bad experience can cost you a lot if the word spreads out on these mediums. But how to track and know what is going on, in a place as crowded as social media platforms? In order to take control of social media networks and leverage their popularity, you have to consider using social media management tool. This tool will help you to streamline your communication on social media, help you to provide answers to everyone, and track and record every interaction. When the number of tickets spikes, you need all the help you can muster. If you are not using a customer support ticketing tool already, you have to at least consider it. Why? Because it makes ticket management simple. With the help of this tool, you can interact with customers across multiple channels. This includes live chat, email, phone, and others. Your managers can also assign agents their tickets quickly whenever it is necessary. Some of these tools also come with automated features to help you remove redundant and time-consuming tasks from the picture for your agents. Thanks to technological and software solutions, we have access to these 7 tools to help us streamline and improve customer support service efforts. The increasing number of communication channels demands organizations to diversify their customer support efforts in order to meet the new demands and expectations of the modern consumers. Jared is a customer-support ninja and a marketing evangelist working with ProProfs.com for more than 5 years. After wearing many hats as a sales specialist, a content marketer and a brief stint as project manager; Jared found customer support to be the passion-fueled calling while working with ProProfs Chat. Being an avid book lover, he regularly visits the library and is always keen to develop new strategies to help customers seeking live chat assistance for a delightful experience.